ZwCL 1447.2+2619 is a radio halo + 1 relic system. Giovannini et al. (2009) found a radio relic candidate in the north, however when Govoni et al. (2012) investigated the system with more radio observations they found that this northern relic candidate was actually a radio halo. They did find a new southern radio relic though. 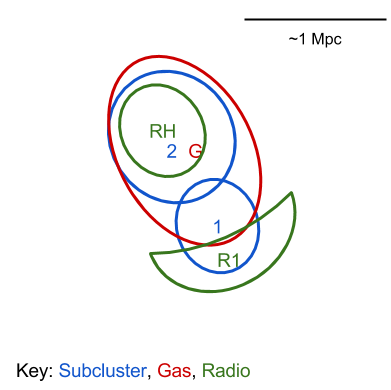 Both the northern radio halo and southern radio relic have considerable point source contamination. Govoni et al. 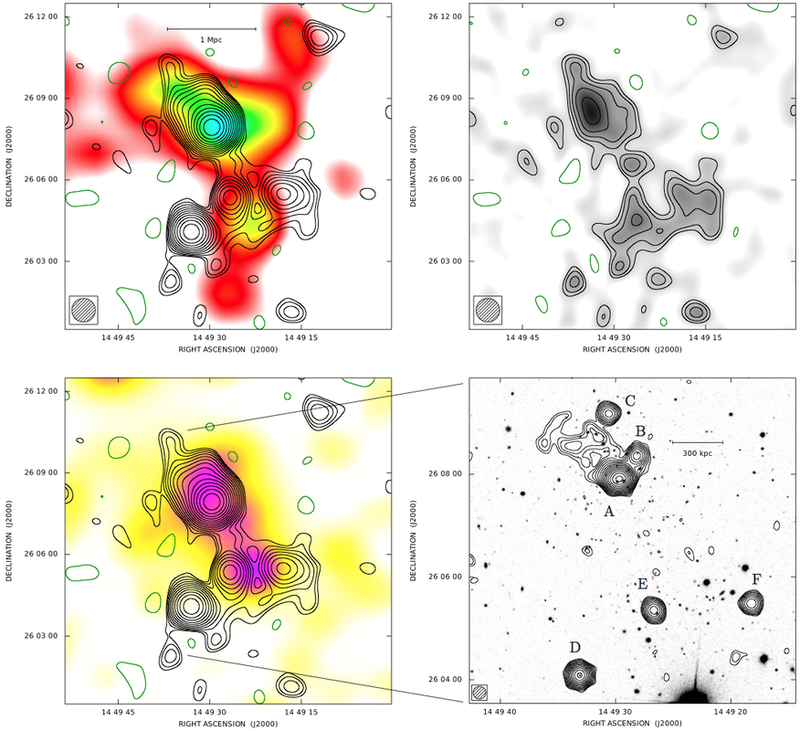 (2009) find that both the Rosat X-ray measured gas distribution and the SDSS measured cluster galaxy distribution are elongated along the axis connecting the radio halo and relic, typical with post merger systems. And the galaxy distribution appears bimodal, suggesting two dominant subclusters. Since ZwCL 1447.2+2619 (a.k.a. CL 1447+26) is part of the Dressler et al. (1999) sample of "10 Distant Rich Clusters of Galaxies" it was studied a fair amount in the early 2000's. Particularly in regards to galaxy evolution. Based on Rosat X-ray image, SDSS, and VLA from Govoni et al. (2012). Dressler, A. et al., 1999. A Spectroscopic Catalog of 10 Distant Rich Clusters of Galaxies. The Astrophysical Journal Supplement Series, 122(1), pp.51–80. Govoni, F. et al., 2012. Detection of diffuse radio emission in the galaxy clusters A800, A910, A1550, and CL 1446+26. Astronomy and Astrophysics, 545, p.A74.